UPDATED: Tue., June 26, 2018, 12:14 a.m. 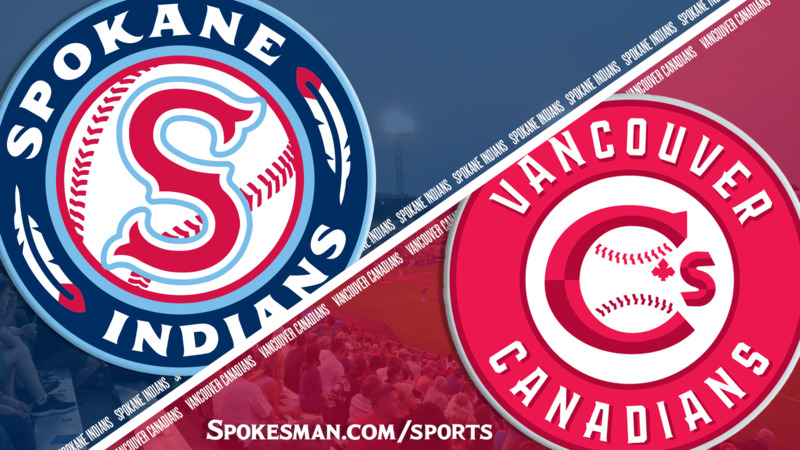 Considering how sharp both starters were in their first games of the season, Monday’s finale of a three-game series between the Spokane Indians and Vancouver Canadians set up as a pitcher’s duel. One of them lived up to the billing. Ryan Dease became the first Spokane starting pitcher to pitch seven innings this season and the Indians topped the Canadians 6-0 in a Northwest League clash at Avista Stadium. The lanky righty allowed four hits with no walks and five strikeouts over seven innings. “Our starting pitching is going to take us where we need to go as a club,” manager Kenny Holmberg said. “I think at this level in order to move you you have to command two pitches: fastball in and fastball away,” Holmberg explained. “That sets up good breaking balls, that sets up the change, makes hitters expand on breaking balls. Dease, a 2017 fourth round pick of the Texas Rangers, was coming off back-to-back wins, one in AA-Hickory on June 12 and last Tuesday for the Indians. In his most recent outing, the Florida native surrendered two runs in five innings, striking out three. Canadians starter Elio Silva’s first start was arguably the most dominant in the NWL so far this season. The Venezuelan lefty, a 2015 non-drafted free agent, allowed one hit in five shutout innings on Monday against Eugene. It started out as predicted. Dease (2-0) retired the first six Vancouver batters, including a diving catch by Obie Ricumstrict in left, while Silva’s only blemish the first two innings was a single off the glove of right fielder Freddy Rodriguez that just as likely could have been an out. Dease noticed the defensive support. Dease gave up a single to Sterling Guzman to lead off the third and hit leadoff hitter McGregory Contreras with two down, but got catcher Chris Bec to bounce into a fielder’s choice to end the threat. Silva didn’t have it as good in the bottom half. Isaias Quiroz ripped a double off the base of the left-field wall, went to third on a balk by Silva and scored on a sacrifice fly to center by leadoff hitter Miguel Aparicio. Vancouver second baseman Nick Podkul’s sinking liner eluded Ricumstrict’s diving attempt in left and went for a two-out double in the fourth, but Dease struck out Reilly Johnson looking to end the inning. The Indians got something going in the bottom half. Starling Joseph lined a double to left and went to third on Diosbel Arias’ single. Arias stole second and both scored on Kevin Mendoza’s single to center. The throw went through to home, and catcher Bec nabbed Mendoza trying for second. Meanwhile, Dease cruised. He gave up a leadoff double in the fifth but retired the next three on a pair of grounders and foul out to first. He recorded another 1-2-3 inning in the sixth with a strikeout. “As the game went on, especially the third-fourth inning, you kind start to know what’s working,” Dease explained. “You understand, you don’t really have to think much out there. The Indians gave Dease some cushion in the bottom of the sixth. Arias led off with a single, then Curtis Terry clubbed a mammoth blast high upon the screen above the left field wall to give Spokane a 5-0 lead. “Curt going big fly, he’s done it quite a bit, especially big here in a big game for us to win our first series,” Dease said. Terry said he has been in a little slump, but the homer helped him break out in a big way. Silva was lifted by Vancouver manager Dallas McPherson and Orlando Pascual took over. With two down Pascual walked Quiroz and hit Ricumstrict, but Aparicio popped out to end the inning. In the seventh, Dease gave up a leadoff single to Podkul, but got three straight groundouts to get through the inning without damage. Reliever Sean Chandler gave up a walk and hit by pitch in the eighth but struck out Jake Brodt to get out of the trouble. The Indians piled on in the bottom half. With two down, Juan Ventura walked and Quiroz was hit by a pitch. Ricumstrict then laced a single to center and Ventura chugged home to make it 6-0. Published: June 25, 2018, 9:12 p.m. Updated: June 26, 2018, 12:14 a.m.